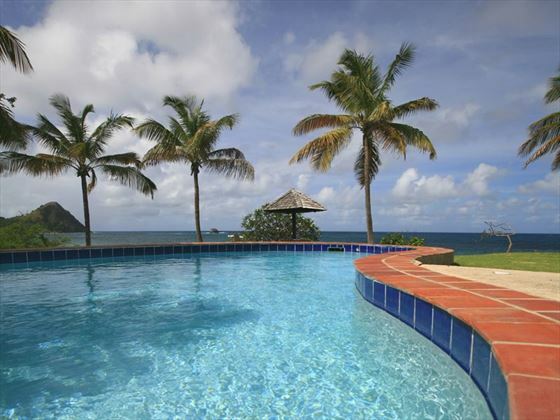 This villa is perched in a beautiful setting by Smugglers Cove, with the hillside location offering panoramic views out to sea including Pigeon Island National Park and Anse Becune beach. 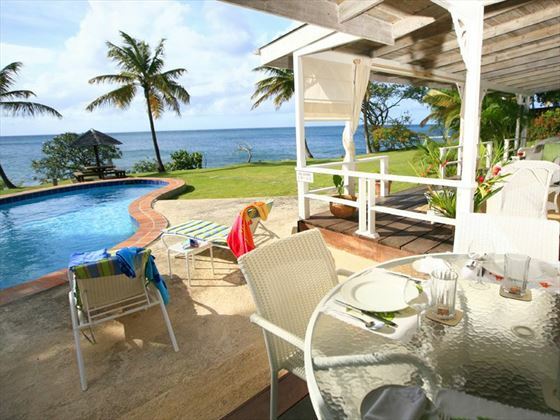 There is a large landscaped garden, with a gazebo which is perfectly positioned for enjoying sun-downer cocktails and al fresco dining. A patio furnished with sunloungers leads from the villa to the kidney-shaped pool which is sunken into the lovely garden. 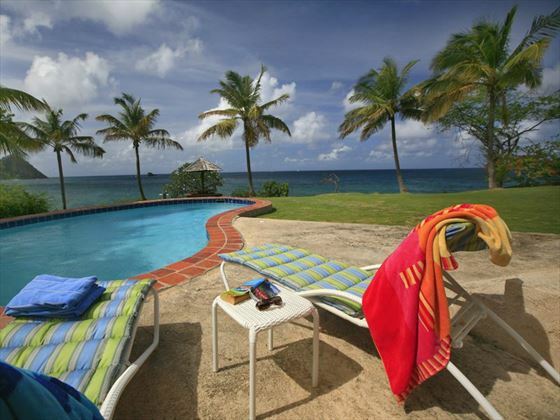 Villa Sea Pearl is comfortably furnished in traditional Caribbean style, with bright fabric and white wicker furniture. 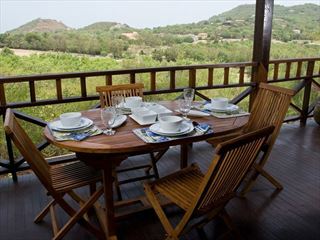 There is an airy living room and separate dining room, both which open out onto a lovely long terrace. Cook service is included in the price, along with six days a week housekeeping, so you may only need venture into the well-equipped kitchen to fetch a drink from the fridge. 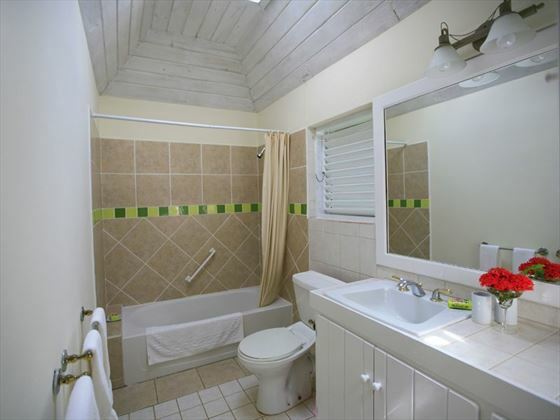 There are two comfortable bedrooms, each with air-conditioning and ensuite shower room. Top Tip: Hop into a taxi one evening for the short drive to Rodney Bay and try out some of the great bars and restaurants. Car Hire is highly recommended: Private taxi transfers are included in the price of all of our villa holidays to ensure you have an easy and stress-free journey to and from the airport with your luggage. The car will be delivered to your villa, and you can then use the car for exploring the local area – they drive on the left, so it’s nice and easy. We will arrange your car hire from £250 per week per car. 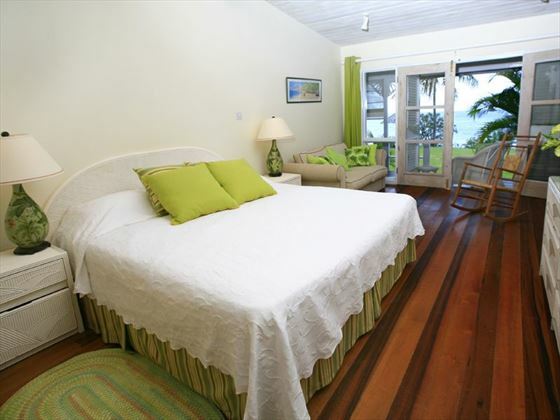 Single storey two bedroom villa sleeping a maximum of four people. 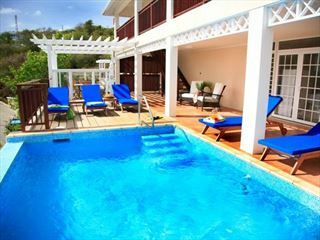 Villa Sea Pearl can also be rented at a lower rate as a one bedroom villa for two people. 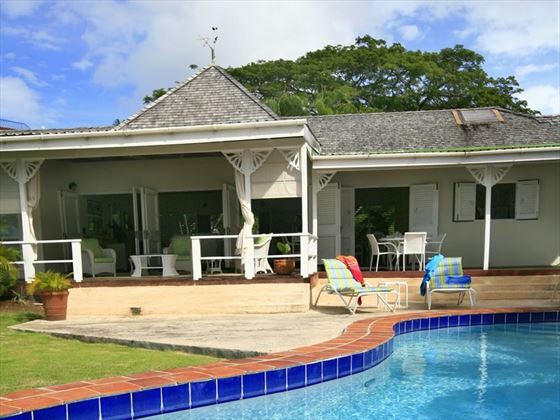 With air-conditioning throughout and a housekeeping and cook service every day, this three bedroom villa offers a high level of comfort and relaxation. 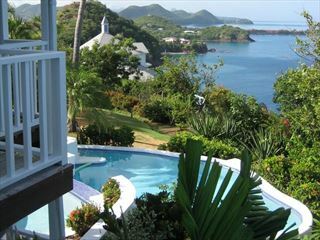 Located in the north of St Lucia, you can while away the days contemplating the magnificent views of the Caribbean.